Saturday night proved to be a big one for actress Uzo Aduba, who is known for her role as Suzanne “Crazy Eyes” Warrren on Netflix’s homerun hit, Orange is the New Black. 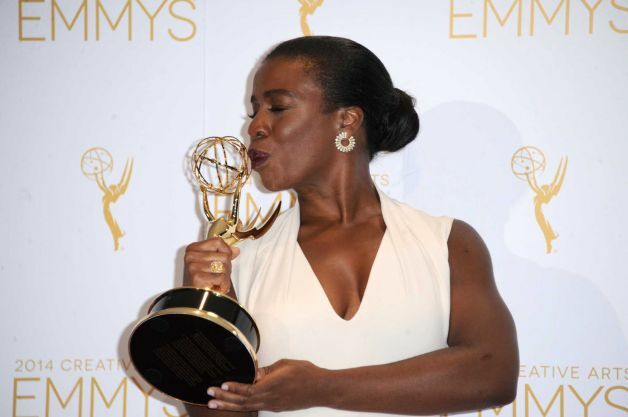 Aduba, who is of Nigerian descent, beat out co-stars, Natasha Lyonne and Laverne Cox to nab the Emmy for outstanding guest actress in a comedy at the 2014 Primetime Creative Arts Emmy Awards. The ceremony took place at the Nokia Theatre in Los Angeles, and Aduba who looked smashing in a Costume Nationale ensemble, tearfully accepted her award from veteran actor Morgan Freeman. During her acceptance speech, Aduba acknowledged the fact that her nomination was reason enough for celebration. The character of “Crazy Eyes” has helped garner the Emmy-winner somewhat of a cult following. Her recent win certifies the fact that there are bigger and better things in store for this rising star. If you are curious to know what all the ruckus is about, click here to find out why Orange is the New Black needs to be your new obsession.